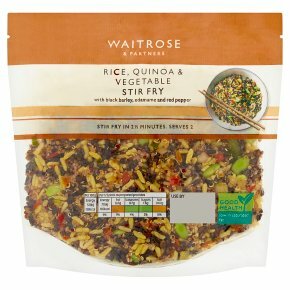 INGREDIENTS: turmeric rice (water, long grain rice, rapeseed oil, turmeric extract), black rice (water, black rice), quinoa (water, quinoa), edamame beans (soya), black barley (black barley, water), red pepper, red quinoa (water, red quinoa), spring onion, sunflower oil, water, soya extract, salt, ginger, sugar, garlic, barley malt extract, black pepper. Allergy Advice For allergens, including cereals containing gluten, see ingredients in bold May also contain nuts, peanuts and sesame. May contain: peanuts, nuts and sesame.